The joy that we derive at the sight of food. One which makes us dance. I remember making jollof rice; knowing that I didn’t make any meat sauce. I used some local seasonings and at first taste I was dancing with all my heart and soul. The Hausa people call this behavior of dancing at the sight of good food Santi. The first time I fried plantains…as easy as those things are to do, it’s easy to get the cooking process wrong. The temperature of the oil has to be just right for the insides of the plantains to cook. I fried the plantains and at first taste, I danced my heart away. How many of you dance when you eat a very delicious meal or at the sight of golden fried puffpuff? Even Mr Jollof knows that where there is good jollof; there is no competition. Jollof is Jollof! Make it delicious, fry that stew, mix those spices and in the words of the bang master bangdadadang baby! Even Kokun knows that food is right for everyone. By the way guys, please follow @kokunfoundation. He is doing amazing things to eliminate hunger in Nigeria. 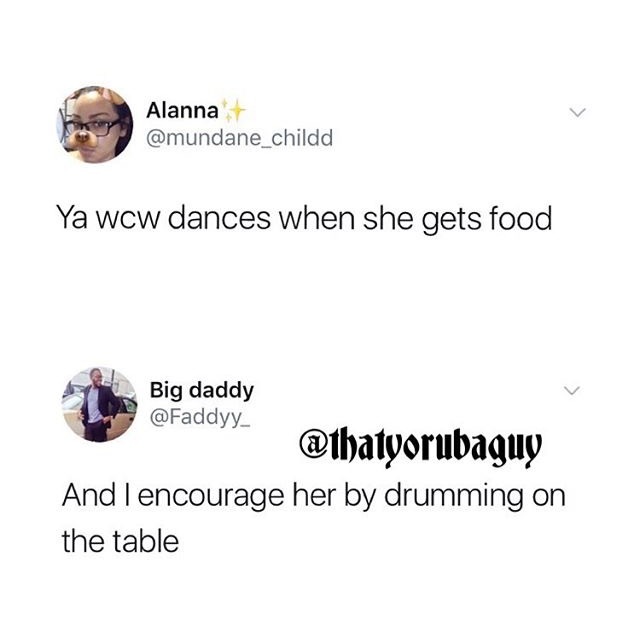 Or is it when your crush dances at the sight of food? I don’t dance. There is however a sound I make when the food tastes so nice. My siblings have dubbed it santin Nana and they mimick it when they are eating something they like, in an attempt to tease me. (I’m called Nana at home and by people who know me well, pronounced like cooking). Santi is evidence that what someone’s EATING is delicious. It’s an expression of excitement. For example when you give Modees Usman a taste of Rubywoo flavoured jollof and while eating, he begins to sing and bob his head, or he asks you how the food was made. In hausaland, he’ll be seen to be making “santi” and anyone around will put a wedge behind him (which could be anything ranging from a pillow, a bag or a chair; especially when he is sitting without a back support) to prevent him from falling over due to santi. About a couple of years back, a damsel from my neighbourhood came to my house at night. It was during the fasting month you see, so I offered her iced tea. At first she declined, saying she was okay, but then I insisted and so she agreed. One of my younger brothers was around, hence I gave him a glass to give to her. After tasting, her response was: “wane flavour ne? Sorry” (what flavour is it? Sorry). My brother still laughs over it, saying that she did “santi“, after declining the drink in the first place. This entry was posted in Uncategorized and tagged food and dance, foodgasm, jollof rice, santi. I’m a slow-eater, but when I taste GOOD FOOD, I close my eyes and savour all the goodness. Whatever expressions I give at that moment is for viewing pleasure. lol!